Every church member enters the building and instantly sees several things. Door greeters, clean facility, smiling faces, coffee bar, dim lighting in the worship center along with a countdown video, music, and possibly colored lights for added effect to the stage. When the countdown video ends the band enters and thus begins the worship service. The service seems to go smoothly and without fault; every server in their place at the right time. So, how does this happen? What types of things take place throughout the week for a worship service to work? Above all else, the power of prayer. The Holy Spirit will provide the best ideas for you without losing your mind trying to get creative juices flowing. James says, “The prayer of a righteous person is powerful and effective” (James 5:16). In this context James is talking about praying for each other for healing, but who’s to say the Lord won’t use our talents in powerful and effective ways? I can’t think of any better way for one to use their talent but for the Lord. Meet with your team on a weekly basis. These people are the leaders who run the sound booth and other tech, the senior minister and the worship leader. In this meeting you may want to discuss the pros and cons of the previous Sunday. Ask questions such as: “What did we do great?”, “How did the congregation respond?”, “What fell through and why?” Answering these questions will help you plan services in the future and get to know your congregation well. Next, focus on the upcoming Sunday. Ask basic questions such as: “What is the sermon series?”, “What is the specific topic for this Sunday?”, “What is the minister’s main thought and scripture?” Answering these questions will begin the skeleton for Sunday worship service. Worship elements should include the congregation and focus on the application of the message. There is never a time to show off talent in a Sunday service. Make everything you do intentional. Answering these questions gives the skeleton meat. Finally, choosing an appropriate song set completes your body. Songs can be chosen based on sermon series, topic, scripture reference, etc. Be cautious of song lyrics. Not every worship song written is meant to be sung in a congregational setting or is biblically accurate. Personally, I try to stay away from songs in first person unless it is intentional and applicable for the congregation. Whatever you do, be intentional. Don’t incorporate a worship element or song during service because it’s cool or it’s something you’ve “always wanted to try”. It MUST have a specific focus and goal for the congregation. Otherwise confusion will set in and awkwardness may take over, leaving the impression the church is only there to be entertained. Do not throw any ideas away. File them and use them later. Proverbs tells us, “Many are the plans in a person’s heart, but it is the Lord’s purpose that prevails” (Proverbs 19:21). The Holy Spirit will tell us what works and what doesn’t. Trust in him to guide you with the right intentions so the “Lord’s purpose prevails”. Remember, the goal as the church is not to give goose bumps to the congregation; it’s to give God the glory. 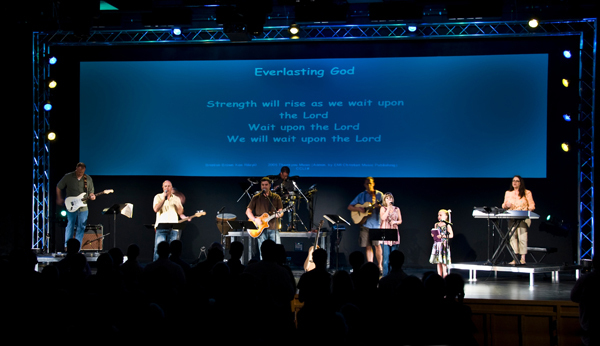 What’s the most important part of planning a worship service? Share your thoughts with a comment below!